This is the second in the series of Abby Shaw who owns Divinity, a candy shop in Paradise, Colorado, who she inherited from her Aunt Grace. It's time for the 10th Annual Confectionary Competition at Divinity and who should enter, but the town estranged town harlot, Savannah Vance nee Horne. Surprisingly and much the chagrin of Evie Rice, Savannah wins first place in the first night of the contest, which brings a load of hate from Evie Rice who hates Savannah and has a serious competitive streak. Turns out a lot of people hate Savannah, mainly for stealing men, but because she's cold as the winters in Colorado. So, is it any wonder she should turn up stone cold dead a few days later, found by none other than Abby. Detective Jawarski, who she met when her brother was under suspicion of murder in the last book, advices Abby to steer clear of this case, and she intends to do just that, honest, she does. However, she keeps stumbling over bits and pieces about Savannah's life and eventually puts the clues together as to who murdered Savannah and why. Carter has a good series going. Abby's a good character. She makes mistakes, tries to do the right thing, worries about her business, and has a family who loves her even if they don't let it show. However, I think the character who steals the spotlight is Max, the Doberman she adopted when her friend was murdered in the first book, Candy Apple Dead. She felt sorry for Max who's master died (he mourned terribly) and nobody wanted to take the dog in. Abby's only problem is she runs a candy store and can't have Max downstairs due to the health codes. His previous master took Max to work all the time. Naturally, Max gets lonely and destroys various items in her apartment. She takes it all in stride and scolds him, but her heart reaches out to him. Typically, cozies feature a lovable animal, cats or small dogs, but Carter has decided to take the plunge and have a Doberman and it works. I adore Max and I think Abby might feel the same way. So is this one of those books that includes the various recipes? 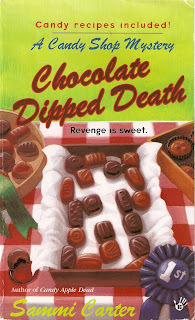 Yes, it has recipes for Divine Saltwater Taffy, Cappuccino Divinity, Lady Slippers (butterscotch drops), Strawberry Bonbons, Rocky Road Drops, and Celestial Chocolate French Toast. Oops, I think I gained five pounds just listing the treats. The rest of her books are titled Peppermint Twisted, Goody Goody Gunshots, and Sucker Punch. Better hit the walking trail and weights. Have you ever read any Diane Mott Davidson? This series sounds alot like her Goldy the caterer books. Not yet, but her book Catering to Nobody awaits for me on my shelf. Another caloric dangerous series to get involved in is Joanne Fluke's series with Hannah Swenson, who owns the Cookie Jar.